The AUTHENTIC Costa del Sol, east of Malaga is a beautiful area known as La Axarquia. Share everyday life, see stunning photos and learn all about pretty white villages. Once youÂ´ve arrived youÂ´ll never want to leave! 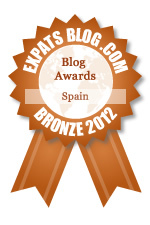 ExpatsBlog.com Expat Blog Awards 2012: Spain Bronze Award! This blog won the Bronze Award for best expat blog in Spain! Great photographs which make me want to visit and spend some time getting to know the area, east of Malaga. ItÂ´s not an area IÂ´ve ever been to, but regular visits to this blog make we want to go out and buy an airplane ticket. Useful info about living a different life in Spain. Great blog and great photos too. This blog is outstanding. Marianne clearly knows and loves her subject and writes with such enthusiasm. It is always a joy to see what her next topic will be and I am never disappointed. Perhaps most of all her photography is the highlight. Carefully chosen subjects shown to their very best. A truly happy and informative blog - Keep up the excellent work Marianne. We love reading your blog as a reminder of what we are missing when we are back in the UK. We love spending time in the Axarquia where we have a holiday home. CanÂ´t wait until we can live there full time once we have retired. What a joy it was to see your recent photos of the goats on the road - so typical. Excellent blog - keep up the good work Marianne. I love this blog. The photos are both stunning and inspirational, and the blog invariably prompts me to get out and explore the AxarquÃ­a region in particular and AndalucÃ­a generally. She captures perfectly the atmosphere of the atea in her writing, and on top of that is a generous blogger - always commenting constructively on other people's blogs, and promoting other bloggers through her monthly "blog-hoppers" photo challenge. GREAT blogger - thoroughly deserving of this award. Love this blog, the writing is so good and the photos are always stunning. One of the very blogs that I actually follow. I live here and IÂ´m still finding new places to visit. Got some great ideas from this blog though. A fabulous blog and fully deserving of any award that comes its way. I have been travelling to Spain for many years and didn't realise I was missing out on so much until I read this blog. Both the writing and photography are top class. Follow this blog!! Such beautiful photos, exploring hidden corners that I didn't know about so close to where I live. If you want to know about living east of Malaga and little-known places to visit and explore, Marianne is the one to ask. Although I live in Portugal and Spain is only a stones throw away I rarely get to go there so reading this blog is like having my own personal guide to the delights that Spain can offer. The photographs that are posted leave one with a sense of wanting more and more, or is that just greedy? East of Malaga is a must blog for people who like know more about different places. Bringing a side of Spain to me, that I've never seen or experienced in my times there. A terrific blend of sun, food and landscapes all blended together with the culture that is obviously only Malaga. Love the pictures and the posts - very informative! Marianne's East of Malaga is a wonderful culturally rich blog. It's vibrant and well photographed, and she is doing a great job for the Spanish tourist board -they should reward her! Marianne always captures and holds your attention. I wish my photos were as good. This is the only blog inSpain you need to follow. Marianne takes you by the hand on her journeys through Spain. She has inspired me to visit Spain one day and resume the Spanish lessons. Gorgeous photos and a generous blogger too! Marianne runs an excellent and inspirational blog. It's the perfect kind of balance between writing and photography that makes you wish you were there! A wonderful blog with beautiful photography. Marianne does a great job of bringing her little slice of the world to life. There's a lot of conversation (in the form of comments and responses) with readers. Very informative and fun! There's something very refreshing about this insider's view of Spain - especially of the villages and culture of the Malaga coast. Marianne shares everything from the cost of living to readying the cemeteries for the big party of All Souls Night ... something for everyone, and vastly entertaining. Absolutely fantastic blog; gave me so many ideas about places to visit to the East of Malaga!Fabulous photos, great descriptions and a wonderful insight into the life and culture on the Costa del Sol. I would recommend this blog to anyone wanting to visit this beautiful part of the world. East of Malaga is my go to blog whenever I need a 5 minute vacation in the middle of my day. Marianne's gorgeous photography captures the everyday beauty of the the Costa del Sol, a place I'd love to get to now because of this wonderful blog. This is a blog which is great for finding out about unexpected corners of Axarquia and the eastern Costa del Sol, illustrated with excellent photos. I'm compiling a list of places to go which have been recommended on here! Fabulous photography and engaging on writing on this great blog from a sometimes overlooked corner of the south of Spain. East of Malaga features photographs to shame my cack-handed attempts, writing that transports to you the magical world of La Axarquia, and recipes offering an authentic taste of this little corner of Spain. The beautiful photos on East of Malaga are pure eye candy and have pricked my interest in visiting a part of Spain I knew little about. Time spent reading the brilliantly written information means that I'm about ready to pencil in a date next spring. Savour the flavour of Spain via the fabulous large-format photos on this delightfully visual blog. Love reading this blog first thing in a morning, with a cup of coffee. Gets my day off to a great start - losing myself amongst the mountains and sunshine of Andalusia. So glad I found this blog. Beautiful pictures and places to visit in a much quieter area of the Costa del Sol. Perfect place to chill. Keep posting. Who wouldnÂ´t want to visit east of Malaga after reading MarianneÂ´s blog? Great resource for visitors and expats alike. I particularly like reading about the little things not mentioned on other sites - like herds of goats on the road or collecting post from the post office box. ThatÂ´s what makes it so real for me. MarianneÂ´s blog absolutely has what it takes to win the Expats in Spain Blog award. ItÂ´s informative, interactive, attractive and fab! I was sure that I had already reviewed MarianneÂ´s blog, but as it hasnÂ´t appeared in the comments, I feel I must try again. ItÂ´s always a pleasure to look at the photos and learn about new places to visit in this often overlooked area of the Costa del Sol. You should try out some of her recipes too - the figs wrapped in bacon, stuffed with goatÂ´s cheese is amazing! A fab blog packed with information and insights and beautiful photography! Great blog with a fun monthly photo challenge. I look forward to reading this blog! I was so excited to find East of Malaga. Marianne's blogging is like a breath of fresh (Spanish) air. I am about to take part in her photo challenge for the 1st Day of the Month, and love her glimpses into an Expat Life in Spain. 'East of Malaga' is absolutely one of my favourite blogs. Marianne's photos are stunningly beautiful, and she has such fascinating info about living life in this part of the world. I have been to Spain twice, and I always learn something new and interesting when visiting 'East of Malaga'. It's definitely a winner. I only wish I had known of "East of Milaga" when I last toured Spain. Marianne "takes" us to wonderful places and events removed fron the normal tourist haunts. And all of it accompanied by some beautiful photography. Excellent blog with great pictures. I'm a follower! This is one my favorite blogs. I love Spain and this blog is based in the area I would like to retire to. Marianne's posts about her life in southern Spain really inspire me and are very informative as well. She's already given me ideas on things to do, places to eat and she's even got a post about the cost of living which will definitely come in handy when we get to the point of planning our budget. There's also wonderful photos to view. An all around great blog that deserves to win!! What a varied and interesting blog!! I found "East of Malaga" to be insightful, informative and fun. It is also very motivating and helps me to see what I can do with my own blog! I'm lucky enough to live in the area, well a little further East on the Costa Tropical and love this newly discovered Blog. Authentic, interesting and with great photography...I'll be following in the future to keep abreast of anything I'm missing! I fell in love with Spain the first time I visited, and each time I read Marianne's blog I fall in love all over again :-) An absolute winner. As a local of Andalucia I love reading this blog to reind me of things I have enjoyed and to learn about things yet to be discovered! I love Marianne's blog - when I was a kid, I used to travel across Europe with my parents during the school summer holidays and East Of Malaga reminds me of my trips to Spain. I love the stories Marianne tells; she has a beautiful way of not just showing you the sights, but of also describing them and the history behind them. It's not an exaggeration to say I live a little vicariously through Marianne's blog! Love this blog, it's one of the few that I enjoy reading regularly. Great job, keep up the great work, love the photos!! Il blog di Marianne Ã¨ fantastico, come le sue foto e tutto quello che ci racconta della sua amata terra ! Great expat blog, particularly for Malaga area. A clean format with great pics! I love Marianne's blog. She uses such wonderful imagery, both in photos and writing. I really enjoy participating in the CBBH challenge, too. I've been following East of Malaga almost from the beginning, so that I still follow, I suppose, says it all. There is always something fresh and interesting to read....and marvelous photos. I have it delivered to my inbox just make sure I don't miss anything! I love this blog. Fantastic photos. East of Malaga is a wonderful blog; well written and well presented with interesting images and photography! It gives a reader real insight into contemporary living in Spain! East of Malaga is the only blog I regularly follow. The enthusiasm and love for this wonderful part of Spain shines out from her interesting articles and wonderful photographs. So glad I discovered Marianne! 'East of Malaga' is a fantastic blog for me. The images are just spectacular and it brings the wonderful area of the East of Malaga alive in my mind. We are going to be moving there within the next 18 months and I long to be there now! This blog really does capture the beauty and diversity of the area. Marianne's "East of Malaga" blog is the perfect example of blogging at its best! The information and excellent photography she shares about life in the south of Spain truly gives her readers a sense of what is is like to live there - from culture to the economy to cuisine. Her posts are full of energy and her commitment to encouraging bloggers and readers to connect demonstrate what a fine advocate she is within the online community. On top of that ... her photo challenges are the best! The East of Malaga blog is one of the most informative blogs I have ever signed up to. I want to move to Spain and this blog has been so helpful in preparing for the move and holidaying there. It is tops, full of excellent articles with friendly communications and responses from Marianne. Always a pleasure to visit this blog. I have learned so much about the area from it. Keep up the good work, Marianne! I love Marianne's blog. Her blog is remarkable; she posts gorgeous pics and wonderful stories. Marianne's blog is really inspiring. She has a talent for getting to the essence of this beautiful region of Spain, and wherever she's been, I always want to go there. Perfect mix of words and images. One of my favourite bloggers. This blog is a real favourite of mine, it's packed full of amazing images that instantly transport you to their destination and bring it alive just through looking at the pictures. Useful content, great photos, interesting challenges. What more do you need? Marianne of East of Malaga is the best ambassador for Andalusia, Spain I know. And it's not even just solely east of Malaga nor Analusia, she has blessed us with wonderful recipes, photography and trips around the world! I vote for this blog to win. It's great to see someone speak with so much passion about Axarquia and the inland area east of Malaga. For the many expats who know it I am sure that they are pleased to have turned left on arriving at Malaga airport as oppsoed to turning right. However, we share Marianne's view as well as the area's leading network of estate agents covering the entire Axarquia region as well as the Costa Tropical of Granada. LPG Spain.